Someone is jumping from a bungee jump platform. Bungee jumping is an exhilarating activity that has been around since the 1980s but has become more mainstream in recent years. It is considered an extreme sport that provides an adrenaline-pumping rush. Michigan has a variety of opportunities for the bungee jumping enthusiast. The state contains several locations that provide a variety of bases to jump from. There are also rental companies and professionals who will work with you to explore and enjoy this exciting activity. 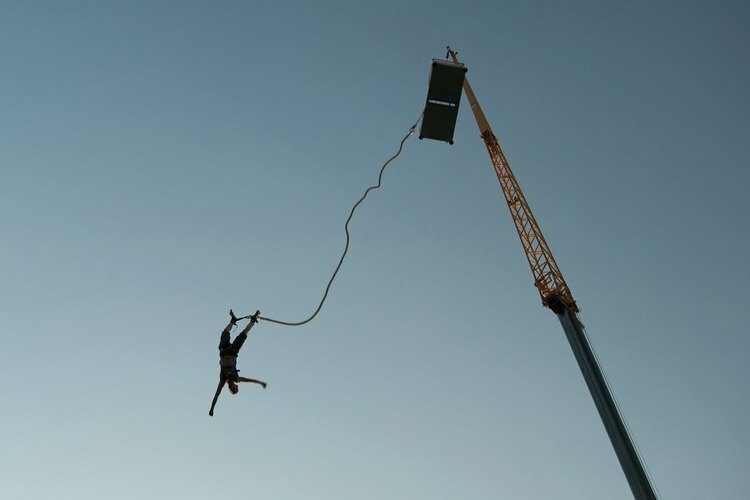 There are various ways to bungee jump. The traditional method involves attaching cords around the jumper's ankles. The jumper then soars from a base such as a bridge or cliff. Another common style often found in amusement parks involves arches that suspend the jumper on a platform and release him in a swinging motion. Finally, trampoline bungee jumping secures the jumper at the waist with multiple cords and allows her to jump, twist and flip under her own power. It is a common misconception that bungee jumping can be harmful to the back or neck. The flexibility of the bungee cords, however, will not cause snapping or whipping of any body parts. Instead, there is an easy glide as the cords reach their full length and once again contract. There is no abrupt stop or change in direction. This smooth action makes the sport safe for jumpers of almost any age and athletic ability. Michigan has several locations to experience bungee jumping. Luxergy is an adventure sport company that offers bungee jumping in several major cities. It is appointment based and will take you on location for traditional jumping. To experience trampoline bungee jumping, visit the Ann Arbor Briarwood Mall. This is a convenient and affordable option. To rent a trampoline bungee jumping set-up, contact Fun-O-Rama in Port Huron. They will transport the equipment to almost any location, set it up and supervise jumpers. When choosing to bungee jump, think about travel, cost and the desired experience. If you are looking for a convenient and affordable jump, consider an amusement park, mall or fair. These locations often have trampoline or arch-based bungee jumping, which offer a more secure and user-controlled experience. If you're seeking an adrenaline rush, traditional jumping may be a better fit. Find services that offer jumps from bridges, helicopters and other high bases. Travel and cost, however, should be considered more with these options. Bungee jumping is considered an extreme sport. Though every possible safety precaution is taken, there is still a risk of injury or death. When participating in this sport, be sure to follow all rules and regulations. Investigate the background of the company or club that is supplying the equipment and instruction to ensure it is safe and licensed if necessary. Bungee jumping is suggested for adults 18 years and older. For children and teenagers, seek locations that offer the expertise and equipment to ensure safety.